The miniature schnauzer is a bold and active little dog. This breed has distinctive features and a square, sturdy build. The personality of the mini schnauzer makes it a feisty, alert dog and loyal companion. Coat and Color: Mini schnauzers are typically seen in one of the three following color combinations: salt and pepper, black and silver, solid black. Miniature schnauzers with white coats are not accepted by the American Kennel Club. Schnauzers have a double coat with the outer coat being wiry and the undercoat being soft. The miniature schnauzer is closely related to its larger counterparts, the standard schnauzer and giant schnauzer. The miniature, standard, and giant schnauzer are each a distinctive breed, but all can be traced back to 15th century Germany. Derived from the standard schnauzer, the miniature schnauzer is believed to be the result of crossing small standards with poodles and Affenpinschers. As a terrier, the miniature schnauzer was once a vermin hunter and farm dog. Over the years, the breed has developed into an amiable, loyal, and protective companion dog. The breed was officially recognized by the American Kennel Club in 1926. While docking of tails and cropping of ears was once common, it is now restricted in many places. The miniature schnauzer has a wiry topcoat and soft undercoat. This breed requires frequent grooming, including trips to a professional groomer every two to four weeks. The typical "schnauzer cut" gives this breed a long, bushy beard, a short coat on the torso, and fluffy hair on the legs. Daily brushing of the coat is recommended. It's also important to keep the nails trimmed for healthy feet and ease of walking. The miniature schnauzer is one of many considered to be hypoallergenic dog breeds and may be suitable for those who are mildly or moderately allergic to dogs. They don't shed much. The miniature schnauzer is happy, intelligent, energetic, and obedient. Proper training and socialization are both essential in order to keep your mini schnauzer happy and healthy. Like most terriers, this breed can have a stubborn streak but ultimately desires structure. Be aware that this breed has a tendency to be quite vocal at times. If your mini schnauzer tends to bark a lot, it is important to start working on bark control early. Overall, the miniature schnauzer makes a wonderful pet for all kinds of households. They will generally socialize well with other breeds of dogs and may get along well with cats. However, if you have small pets such as gerbils, guinea pigs, birds, or snakes, be aware that your mini schnauzer's instincts may lead him to chase them. It's best to keep them separate. Diabetes mellitus: As in humans, a dog can develop difficulty in managing its blood sugar. Cataracts: This is a clouding of the lens of the eye, more common in old age. It can be treated surgically to restore vision. Entropion: This is an inward rolling of the eyelids, leading to irritation of the cornea. It requires surgery for correction. Progressive retinal atrophy (PRA): This is a genetic disease that can lead to blindness. Epilepsy: This is a seizure disorder. Urolithiasis (urinary stones): Surgery may be needed if stones can't be passed. A special diet may help prevent a recurrence. Comedone syndrome: These "schnauzer bumps" are like human blackhead pimples, occurring on the dog's back. Discuss with your veterinarian the right way to care for this skin condition. Von Willebrand disease: This is an inherited bleeding disorder due to the lack of a clotting factor. Myotonia congenita: This is a genetic musculoskeletal disorder that is like muscular dystrophy in humans. Breeders should test for the gene. Feed your miniature schnauzer twice a day, with 1/2 to 1 cup of dry food split between the two meals. Miniature schnauzers are prone to having high fat levels (hyperlipidemia), and some may need a special diet to help manage their fats. Don't give the dog table scraps or unhealthy human food as treats. As with any dog, keep tabs on whether your dog is gaining weight, as obesity can shorten his lifespan and increase his risk of diseases. Discuss this with your veterinarian to see if he will need a special diet or more exercise. You should brush your dog's teeth daily, or at least two to three times per week. This will keep his breath fresh and help prevent gum disease and tartar buildup. Miniature schnauzers are considered hypoallergenic and don't shed much. This breed socializes well with other dogs and usually with cats. Mini schnauzers are friendly, personable, and affectionate. Schnauzers are prone to health issues, including diabetes, cataracts, and urinary stones. 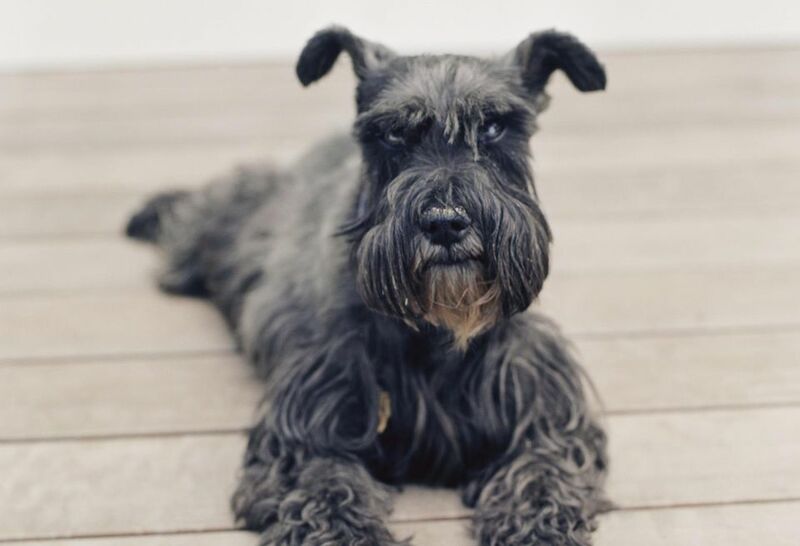 If you're looking for a miniature schnauzer for your family, check out adoption or rescue groups, as well as reputable breeders. The American Miniature Schnauzer Club works with rescue groups and local clubs to rescue and rehome dogs in need. Additionally, you may find miniature schnauzers up for adoption at local animal shelters. As with any breed, if you think the miniature schnauzer is right for you, be sure to research the breed well before getting one of your own. Talk to veterinarians, pet professionals, other miniature schnauzer owners, reputable breeders, and rescue groups to learn everything you can.